It's been a while since I've had a good Netflix binge. And by binge, I mean watching episode after episode like a drug addict. It's not too late - I can watch just one more. Just one more! (And then around 2am I finally go to sleep). I've done the binge with several excellent series on Netflix: Orange is the New Black (all 3 seasons), Breaking Bad (all 5 seasons), House of Cards (all 3 seasons), and The Walking Dead (all 5 seasons), among others. When I'm in, I'm in. It generally takes over my life for as many days as it takes to watch the season (which I usually do in record time), and my husband has learned accept the fact that he will be ignored until I'm done. It's not a healthy way to spend time, to be sure, but it's oh so fun. It's relaxing and mindless and entertaining. This past month, when I was immersed in Whole 30 madness, I needed the distraction. Thank you, Netflix, for giving me Narcos. Narcos is a Netflix produced drama series based on the life of Pablo Escobar. Embarrassing fact - I didn't know who Pablo Escobar was. I mean, I kind of knew. Some drug king pin from the the 80s? I had no idea about his story or his rise or his fall or his impact on Colombia (and the world). It's one of those stories that seems too bizarre to be true. And notwithstanding the inherent dramatizations, the bulk of the story portrayed in the series is actually true. I know this, because I found myself googling throughout each episode. That can't really be true. No kidding? It is true. The story follows Escobar from his humble beginnings to drug lord to his virtual hijacking of the country of Colombia. In the process, he became the 7th richest person in the world (in 1989), and subsequently ran and was elected to public office. When his drug connections were made public, he was forced to resign, and subsequently waged war on Colombia - bombing airplanes, assassinating politicians, and holding prominent figures hostage (including the daughter of the former president of Colombia, who was killed). Ultimately, he turned himself into the authorities and went to prison, but it wasn't just any prison. It was a prison that he built for himself, where he was the only inmate, and Colombian authorities weren't allowed on the premises. (Picture gambling, women, a soccer field.). When Colombian authorities eventually stormed the "prison" (because two people visiting were murdered there), Escobar went on the run. He was killed approximately 18 months later, after authorities were able to track him via his cell phone. 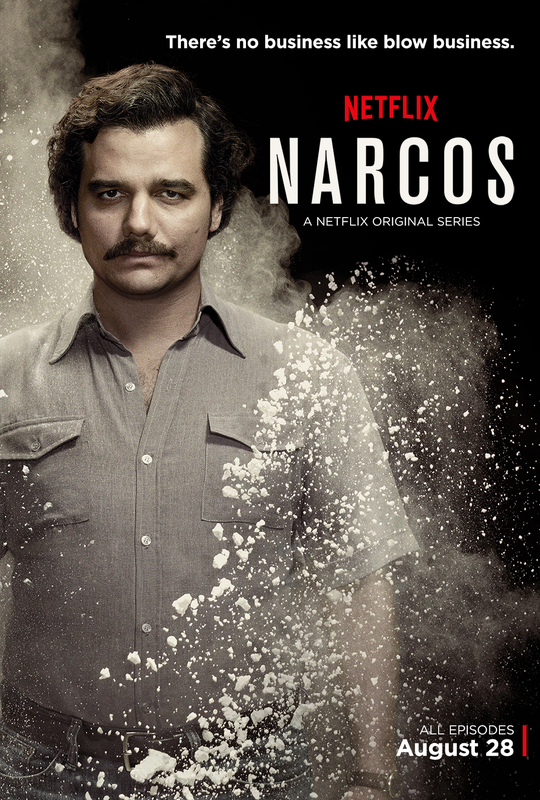 Already knowing the history of Pablo Escobar doesn't make the series any less compelling. In fact, the first season doesn't end at the "end," which allows a second season to follow, and will presumably end the way we all know it ends. But the events were so unbelievable that watching them play out is fascinating. It also does the really weird thing of, at times, making you root for the bad guy (a la Breaking Bad). At certain points, my emotions got confused and I found myself questioning who is good and who is bad and if that determination can ever really mean anything. The mark of good television - it makes you think. As an aside, right after finishing Season 1 of Narcos, I decided to watch a documentary featuring Pablo Escobar's son, called Sins of my Father (also streaming on Netflix). In it, Escobar's son tries to make amends with the children of two government officials whom Escobar assassinated decades. Not only did it give a different perspective of the events portrayed in the series, but it was also strangely uplifting to see the power of forgiveness. Netflix has renewed Narcos for a second season (yay! ), but there's no release date yet. In the meantime, anyone have any books to recommend about Pablo Escobar? I'm weirdly obsessed! Disclosure: I received a free iPad as compensation for being part of the Netflix StreamTeam. All opinions reflected are my own. I love Narcos! The good thing about the show is that there is no good or bad characters, everybody is profoundly corrupt. I also really like Wagner Moura, apparently he learn to speak spanish in less than a month - quite impressive. "Killing Pablo" by Mark Bowden.